Calibration is a topic of interest to anyone that performs measurements. Calibration laboratories utilized by infrared equipment manufacturers often represent huge capital investments in hardware and software. Calibration procedures are not only complex, they are also proprietary to each manufacturer prohibiting an unauthorized third party from making any adjustments to an infrared radiometer. While it is not practical to attempt to duplicate a formal calibration laboratory, it is possible for thermographers to perform a simple calibration check within their own facilities with a minimum of equipment and expense. Having this capability allows thermographers to ensure that their equipment is operating within specification while avoiding the cost and downtime associated with calibrations performed by the infrared equipment manufacturer. This short course will discuss simple, yet effective techniques for calibrating infrared equipment. The techniques demonstrated are complaint with accepted industry practice and ISO standards. This material is intended for anyone wishing to perform a calibration check of their infrared equipment. 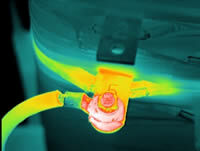 Course is designed for in-house and contract thermographers, maintenance personnel, and managers of infrared inspection programs.